Posted on Saturday, May 17th, 2014 at 10:00 am. Free admission! $3.00 for all day parking. The 16th Annual Taiwanese-American Heritage Week in Los Angeles is about to commence! 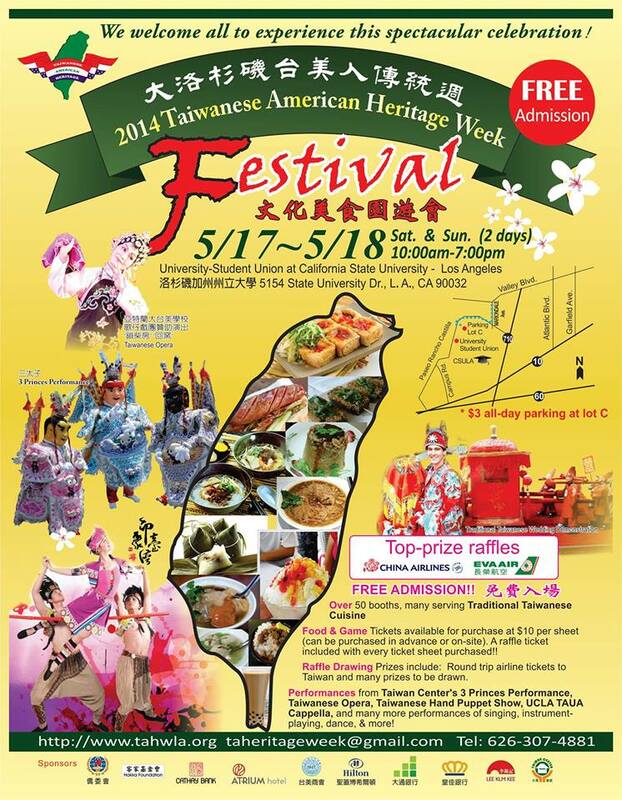 Come celebrate and get to know our Taiwanese-American Community here in the greater Los Angeles Area! This year the TAHWLA planning committee is proud to bring you performances from Taiwan as well as local talents. Headline act: Imagine Taiwan spectacle, Taiwanese Opera, Taiwanese Hakka Performances, traditional orchestra from Galaxy Youth Art Performing Group, Naruwan Taiko (San Diego), Taiwan Center San Tai-zi (Techno Princes 電音三太子), Ms. Taiwanese American Organization presents “Taiwanese-American Idol,” and much, much more! There will be art exhibits as well as presentations from the Taiwan Tourism Bureau! Did we mention glorious Taiwanese Food!?! Everything from the savory to the refreshingly refreshing Taiwanese Shaved Ice. For the kids and kids at heart, the committee has enlisted the help of a special Taiwan Railroad Company train ride! Choo-choo!